As an aspiring writer, I make regular submissions to literary journals. It’s an enjoyable activity, full of challenges and satisfaction. But, it creates an admin task that’s not so much fun. I have to keep track of what pieces I’ve submitted, what journal the submission went to, and what the response was. On the heels of that, there is the job of locating new journals which might be interested in my work. (In my opinion, Authors Publish is the best resource for this.) Once I locate a journal that might be a potential market, I need to monitor their submission windows and deadlines. Do you see the catch-22 approaching? The more pieces I submit, the larger the admin job grows. And, the less time I have to write. What I need is a tool to streamline the process. I’ve tried using a word processor and a spreadsheet. Each proved inadequate for reasons that I’ll not bore you with here. After many years of using different approaches, I’ve discovered something that works. Scrivener is a software application created by writers exclusively for writers. It combines word processor and project management functions into a single author-oriented package. It is important to note that while you can download a free trial version of Scrivener, the full version costs 45 dollars. Scrivener is based on the concept of the PROJECT. A Scrivener project can be thought of as a super file that contains everything an author needs to complete a particular literary effort. The novel I’m currently working on is a Scrivener project. It contains the text of the novel as well as outlines, character sketches, research material and more. I’ve set the binder up to give me the status of each sort story at a glance. The workspace will now show me 3X5 cards with information about each story, including edition and submission history. Note that the workspace now contains the submission guidelines for that publisher. This is not a cut-and-paste job—I’m actually in that publisher’s website, so the information is current. Clicking on the Publishers icon gives me a display of 3X5 cards with additional information about the publishers, such as their preferences and a submission history. 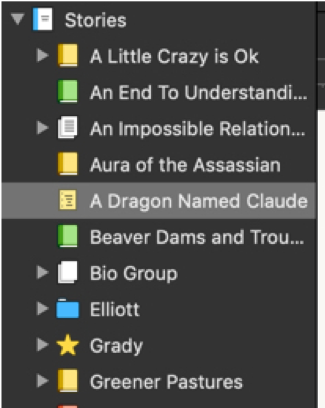 Using Scrivener’s binder function in this way puts all the tools and information I need to create and market my short stories in one place. As I write it, each short story becomes a new entry under Stories. When I finish a story, I can run down to the Publishers section of the binder to find out where it might fit. Once I locate a potential home for it, I can review that publisher’s submission guidelines and submit the story. The converse situation is when I find a publisher who I think might be interested in my work. I make a new entry under Publishers for them. Then I run up to the Stories section to locate a story to submit. When I receive a response to a submission, all I have to do is change the color of a couple of icons and make a few notes. The important thing about this process is that it all happens in one place. 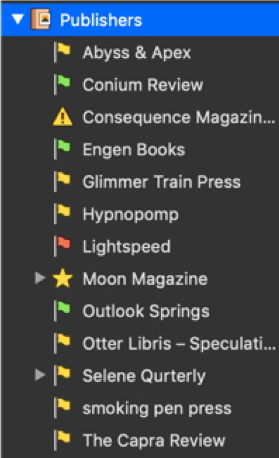 All the activities related to creating and marketing short stories happens within my Scrivener project named “Short Stories.” I don’t have to chase around my hard drive opening file after file to accomplish various phases of the process. Finally, the biggest plus of using Scrivener as an organizing tool is that I was able to set it up to reflect the way I do things. The structure of “Short Stories” reflects the way I think, but it’s not the only way to do the job. Another author might accomplish the same thing by using a structure that is quite different. The binder that they set up to give them an “at-a-glance” overview of their short story marketing effort might look quite different from mine. But, they’d get the same information and result—less time doing admin and more time to write. John A. Burnham grew up in Denver, Colorado. He served in the U.S. Navy and has enjoyed employment in manufacturing, aviation, and the oilpatch. Now, a full time writer, he has one novel, two plays, numerous articles and newspaper columns to his writing credits. He currently lives in Red Deer, Alberta, Canada.